Panic disorder sufferers usually have a series of intense episodes of extreme anxiety during panic attacks. These attacks typically last about ten minutes, and can be as short-lived as 1–5 minutes, but can last twenty minutes to more than an hour, or until helpful intervention is made. Panic attacks can wax and wane for a period of hours (panic attacks rolling into one another), and the intensity and specific symptoms of panic may vary over the duration. In some cases the attack may continue at unabated high intensity, or seem to be increasing in severity. Common symptoms of an attack include rapid heartbeat, perspiration, dizziness, dyspnea, trembling, uncontrollable fear such as: the fear of losing control and going crazy,  the fear of dying  and hyperventilation. Other symptoms are sweating, a sensation of choking, chest pain, nausea, numbness or tingling, chills or hot flashes, faintness  and some sense of altered reality. In addition, the person usually has thoughts of impending doom. Individuals suffering from an episode have often a strong wish of escaping from the situation that provoked the attack. The anxiety of Panic Disorder is particularly severe and noticeably episodic compared to that from Generalized Anxiety Disorder. There are instances when panic attacks are provoked by exposure to certain stimuli e.g. seeing a mouse. Other attacks may emanate out of nowhere or in specific settings e.g. the dentist's office. Some individuals deal with these events on a regular basis, sometimes daily or weekly. The outward symptoms of a panic attack often cause negative social experiences (e.g. embarrassment, social stigma, social isolation, etc.). is an anxiety disorder characterized by recurring severe panic attacks. It may also include significant behavioral changes lasting at least a month and of ongoing worry about the implications or concern about having other attacks. The latter are called anticipatory attacks (DSM-IVR). Panic disorder is not the same as agoraphobia (fear of public places), although many afflicted with panic disorder also suffer from agoraphobia. Panic attacks cannot be predicted, therefore an individual may become stressed, anxious or worried wondering when the next panic attack will occur. Panic disorder may be differentiated as a medical condition, or chemical imbalance. The DSM-IV-TR describes panic disorder and anxiety differently. Whereas anxiety is preceded by chronic stressors which build to reactions of moderate intensity that can last for days, weeks or months, panic attacks are acute events triggered by a sudden, out-of-the-blue cause: duration is short and symptoms are more intense. Panic attacks can occur in children, as well as adults. Panic in young people may be particularly distressing because children tend to have less insight about what is happening, and parents are also likely to experience distress when attacks occur. Screening tools like Panic Disorder Severity Scale can be used to detect possible cases of disorder, and suggest the need for a formal diagnostic assessment. Panic disorder is a potentially disabling disorder, but can be controlled and successfully treated. Because of the intense symptoms that accompany panic disorder, it may be mistaken for a life-threatening physical illness such as a heart attack. This misconception often aggravates or triggers future attacks (some are called "anticipatory attacks"). People frequently go to hospital emergency rooms on experiencing a panic attack, and extensive medical tests may be performed to rule out other conditions, thus creating further anxiety. There are three types of panic attacks: unexpected, situationally bounded, and situationally predisposed. panic fight or flight chemical interaction its effect on. Panic is a sudden sensation of fear which is so strong as to dominate or prevent reason and logical thinking, replacing it with overwhelming feelings of anxiety and frantic agitation consistent with an animalistic fight-or-flight reaction. Panic may occur singularly in individuals or manifest suddenly in large groups as mass panic (closely related to herd behavior). The fight-or-flight response (also called the fight-or-flight-or-freeze response, hyperarousal, or the acute stress response) was first described by Walter Bradford Cannon. His theory states that animals react to threats with a general discharge of the sympathetic nervous system, priming the animal for fighting or fleeing. This response was later recognized as the first stage of a general adaptation syndrome that regulates stress responses among vertebrates and other organisms. Epinephrine (also known as adrenaline or adrenalin) is a hormone and a neurotransmitter. Epinephrine has many functions in the body, regulating heart rate, blood vessel and air passage diameters, and metabolic shifts; epinephrine release is a crucial component of the fight-or-flight response of the sympathetic nervous system. In chemical terms, epinephrine is one of a group of monoamines called the catecholamines. It is produced in some neurons of the central nervous system, and in the chromaffin cells of the adrenal medulla from the amino acids phenylalanine and tyrosine. Eliminating caffeine and alcohol, reducing your intake of sugar, sugary food products, refined carbohydrates and foods with additives and chemicals may help lessen anxiety symptoms. To minimize headaches and other withdrawal symptoms, make reduction of caffeine intake gradual. Instead of caffeinated beverages, try drinking tea made from chamomile (or passionflower, skullcap or lemon balm), which can relax you without causing drowsiness or addiction. 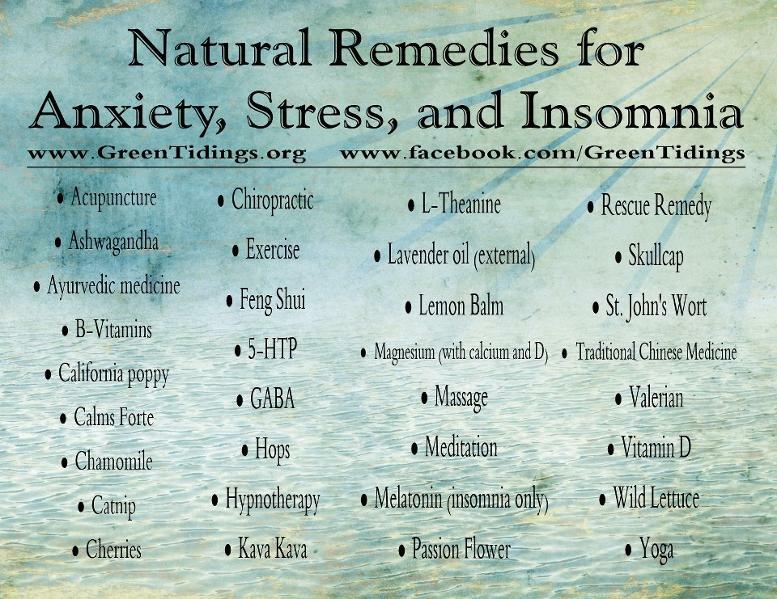 the below is only a guide, we do not recommend using any herbs or oils without consulting a medical specialist.